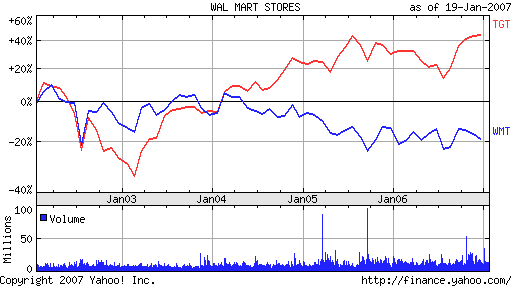 Filthy Wal-Mart = Poor WMT Stock Performance? What’s going on with Wal-Mart, and more particularly, its stock? I’ve been wondering that lately, and will attempt to answer the question later. Wal-Mart is the largest retailer in the world, operating discount stores, Sam’s clubs, neighborhood markets and Supercenters (combined discount stores and supermarkets), but its stock has been meandering in limbo for the last 5 years. There’s usually good reason for a stock to stay stagnant through time. And when a company gets rather large and unwieldy, growth rates slow. This may have a factor in a stock’s not so good performance. If you check a stock’s fundamentals, you may potentially get clues as well. Let’s check a few stock graphs right now, shall we? Uhhh….Did you notice that one chart is the antithesis of the other? They’re in lockstep reverse, almost to the dollar. 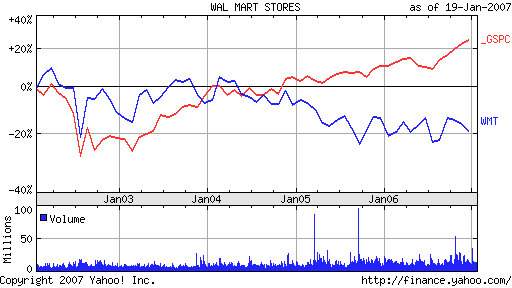 and now apples to oranges….. Here’s Wal-Mart vs the S & P (or SPY). Could it be their price points? Could it be their service? Could it be the merchandise? Or the produce? Could it be its less than stellar reputation? How about its unpopular business practices? Is it the failed fake blog campaign? Or could it be THIS? Upon entering around 8:30pm, I was completely blown away by how disgusting this entire store was, I had to go out to my car and grab my camera. I could not believe my eyes. This place was absolutely filthy….. The ‘Produce’ section was unspeakable. Empty bins with crusty scraps of produce were everywhere. 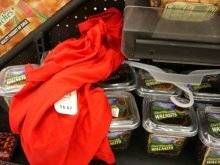 Rotten fruit and wilted vegetables had random merchandise strewn about amongst them throughout their containers. A carton of orange juice sat on the shelf of Windex. So the rout is not only evident in the numbers. For some subjectivity, try the blogosphere’s own opinions with these 10 Reasons Why Target Is Better Than Wal-Mart! I was neutral on WMT before, but now I’m actually afraid of it. However, I don’t want to be a grocery store basher either, it’s not becoming of me. Plus, I’ve seen much worse in many other specialty markets in my neighborhood. However, I DO expect something cleaner than what I’ve just seen from the largest department and grocery store chain servicing a 1st world country, and which still has its share of fans. I can’t really vouch for the store as we don’t have one close by. Shhhhh….. now don’t go around telling them that. Their stock is going down because the growth stock people are abandoning it, plain and simple. WalMart has nowhere to go vertically, and all of the negative press makes it almost impossible to grow horizontally. If I held Wal-Mart, I would sell sell sell. Target, on the other hand, still has room to grow in the marketplace, plus publicity for them is a lot more positive, making it much easier for them to expand into other market niches without as much resistance. I’d be willing to consider buying Target after some more research. I always find it interesting how local observations often directly match the actual state of affairs of the larger corporations. The WalMarts near us are also filthy. I have never been in a dirty Target and now that we have a SuperTarget I love doing my grocery shopping there too. I think America is finally realizing that Walmart has outgrown its limits and grown too quickly. On top of that, Walmart employee benefits are nonexistent. Workers have no incentive to keep the stores clean because they are poorly treated. Businesses must keep their workforce happy or they will experience similar results to what Walmart is dealing with. Yes, I do agree that the key to maintaining a successful business starts with how well management treats their employees and how happy these employees ultimately are. Given everything else being positive, such as products offered, good prices and such, good customer service will then entice good customer experience which will have people coming back repeatedly to patronize the stores. The trickle down effect works. So if a place is not managed well, and employees aren’t trained nor screened properly, then you’ll get this effect. The stock plateauing is a consequence of all these factors. We are excited about Wal-Mart’s entry in India and hope both farmers / producers and consumers will benefit. I found this post really interesting–especially since here in New York, Wal-Mart encountered too much opposition to open a store, while New Yorkers eagerly trek out to the Atlantic Ave. Target, and rumors of a Manhattan location (a scant two blocks from my apartment!) are music to my ears. I think the crucial difference between Target and Wal-Mart is that Target offers a shopping experience that assures you of your taste (presentation, image, and product selection) while congratulating you on your shopping savvy (price point). Wal-Mart, on the other hand, seems to underline the fact of limited means (part of this is just cultural associations). I’m really unschooled in this kind of stuff, and I don’t know how big a part perception plays in stock numbers, but Target’s certainly winning the game of public opinion. As some of the previous comments point out, Wal-Mart just has nowhere to grow in US. It caters exclusively to a customer set at the bottom of the economic ladder with spending power declining even more rapidly than the rest of the working America’s. The efforts to go more upscale have so far failed for a variety of reasons, image/brand problems among them, and, in my opinion, the very poor price to value ratio of most of the merchandise they sell. $7 electric can opener there. It opened a can exactly once and, luckily for me, broke down. Of course, I returned it right away, but couldn’t help thinking, that paying $7 per opened can is an incredibly expensive can-opening arrangement :). This example is indeed only one data point but I believe many other people have the same experience and will come away with the same conclusion of not finding value in Wal-Mart and, thus, not shop there. I have been to many Wal-Mart as well, and I have seen many Wal-Mart which are vey clean as well. 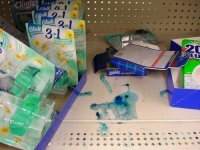 Just because you have seen one Wal-Mart which is not clean on some hours of the day, does not mean that all Wal-Mart are like that. Come to my town, and I will show you clean Wal-Mart, delivery good price value. Also their customer service is fabulous. You can return any item within 3 months with no question asked. I have never had any quality problem with merchandize that I have bought from Wal-Mart. I have very positive experience with shopping in Wal-Mart. 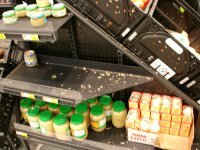 i am an associate that workes for wmt an i will tell you what is wrong with the company.one the security stinks.the customers eat when they are shopping ,open boxes of merchandise let the children run wild in the store. steel left an right.an no one cares. when customers see this they get disgusted an go else were. I totally agree that wal-mart is not a good place to buy perishable groceries, but I think it’s a great place to get great deals on things like electronics like cheap 5 dollar dvds and such. They need to hire some real grocery managers fast though or they will get swalloed by this recession. Also they really do need to start cutting there employes in on some of that massive dough they are making, over time the stores will eventually rise again. I believe Wal-Mart needs to be brought down.. Mike Duke is a piece of crap and he should put his own kids to work in this sweatshop… Wal-Mart is the bottom of the barrel. I will go to Target any day to do my shopping. Mike Duke needs to get robbed and he can feel what his employees feel…. I don’t shop at Wal-Mart for exactly that reason. I remember many years ago buying a $7 electric can opener there. It opened a can exactly once and, luckily for me, broke down. Of course, I returned it right away, but couldn’t help thinking, that paying $7 per opened can is an incredibly expensive can-opening arrangement 🙂 . This example is indeed only one data point but I believe many other people have the same experience and will come away with the same conclusion of not finding value in Wal-Mart and, thus, not shop there. Target, on the other hand, still has room to grow in the marketplace, plus publicity for them is a lot more positive, making it much easier for them to expand into other market niches without as much resistance. I’d be willing to consider buying Target after some more research.